Twice in the past two years, DOT caved to community board pressure against a street redesign, and New Yorkers paid with their lives. In the spring of 2015, DOT proposed a plan for street improvements that involved removing a number of turns from the B36 bus route along Avenue Z and Sheepshead Bay Road, where from 2009 to 2013 traffic crashes had injured dozens of street users and severely injured five pedestrians and two cyclists. DOT shelved the proposal after City Council Member Chaim Deutsch and Brooklyn Community Board 15 objected to it. That December, a B36 bus driver killed 62-year-old Eleonora Shulkin while making a turn that was slated to be eliminated. DOT went ahead with the plan following Shulkin’s death. In the spring of 2015, DOT proposed a road diet and other traffic-calming measures for East Tremont Avenue between Williamsbridge Road and Bruckner Boulevard in the Bronx, where dozens of pedestrians, cyclists, and motor vehicle occupants were injured every year. DOT dropped the plan after Bronx Community Board 10, egged on by the Throggs Neck Merchants Association, voted against it. “DOT stated that it would be happy to abide with the CB 10 decision,” the Bronx Times reported. In June of 2016, a hit-and-run driver killed 26-year-old Giovanni Nin as he rode his bike on East Tremont in Schuylerville, within the proposed project area. Mayor de Blasio directed DOT to implement the plan after Nin was killed, rebuffing shameless cranks who blamed Nin for his own death. DOT has allowed Queens CB 4 to hold up safety improvements for 111th Street in Corona for three years. The plan has widespread support from Corona residents who are forced to risk their lives and the lives of their children, crossing a street designed for highway speeds in order to access Flushing Meadows-Corona Park. Again, a project that would benefit thousands of New Yorkers has been hijacked by a small number of opponents. The one throwing his weight around is James Lisa, who lives on 111th Street and chairs the CB 4 transportation committee. Lisa donates generously to Assembly Member Francisco Moya, who successfully got DOT to water down the proposed redesign. Nevertheless, Lisa still won’t support the project. There’s no excuse to let this process drag out any longer. It’s springtime. As the weather warms there will be more children, with and without their parents, crossing 111th Street to get to the park. 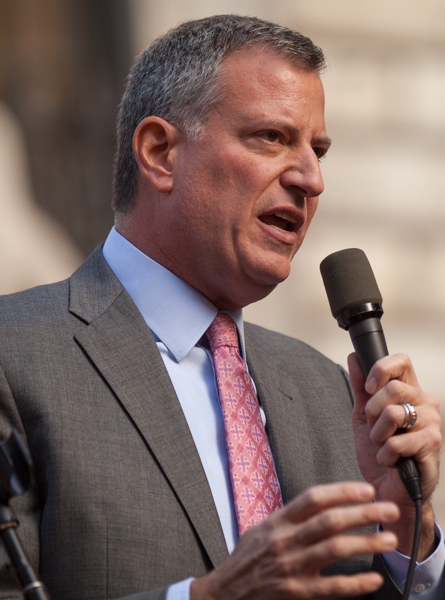 De Blasio cannot allow what happened in Sheepshead Bay and Schuylerville to happen in Corona. The mayor must direct DOT to fix 111th Street now — before, not after, someone gets killed. I totally agree with this writer’s opinions. The Mayor & DOT should do the right thing right now. Second, we have to recognize that DOT has gone the extra mile in trying to meet the demands of the CB4 majority, even though those repeated requests for more study and new data are a transparent attempt by people trying to kill the safety improvements through endlessly repeated delays. As part of its desire to meet opponents halfway, DOT has removed from its plan crosswalks which are key to protecting pedestrians. DOT needs either to revert to its original, superior plan, or figure out a work-around that would allow it to install crosswalks with traffic signal lights. I know the Mayor & DOT want to do the right thing. It’s our job to provide them the political cover to make that easier. Paging Steve V. our legal expert. At what point does the city become liable for damages for something like 111th ? could be held criminally liable or personnely liable for a death on 111th ? Will DOT Make Safety Upgrades Over Objections of Sheepshead Bay Cranks? A DOT safety project in Sheepshead Bay is in effect after a rocky path to implementation. DOT will bring its plan for new bike lanes on Dyckman Street in Inwood back to Community Board 12 next Monday.